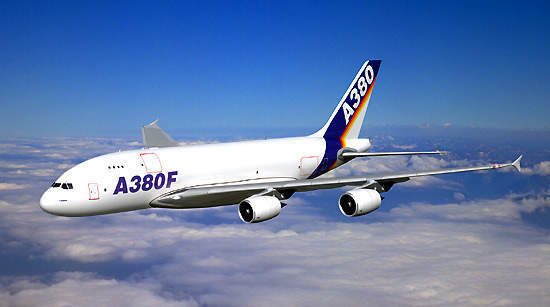 The A380-800F is the freighter version of Airbus' A380 wide-bodied 'superjumbo' passenger aircraft. The A380 freighter can carry a 150t payload, comprising 71 large cargo pallets or containers on three decks. The A380 flight deck has an integrated modular avionics suite with eight 15cm x 20cm liquid crystal displays. Model of the A380 fuselage cross-section, showing the three-deck structure. 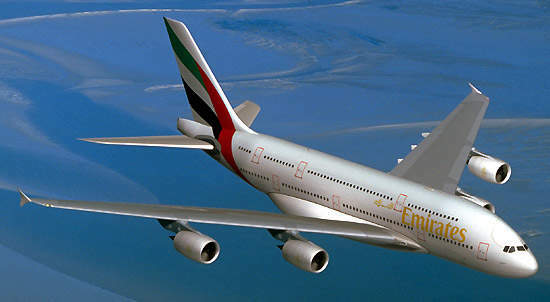 The A380 passenger aircraft in the colours of the Emirates airline, which has 45 aircraft on order. 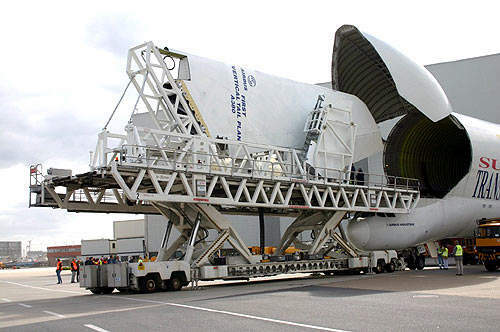 The vertical tail plane for the first A380 aircraft was delivered to the Toulouse final assembly facility by a Beluga Super Transporter. 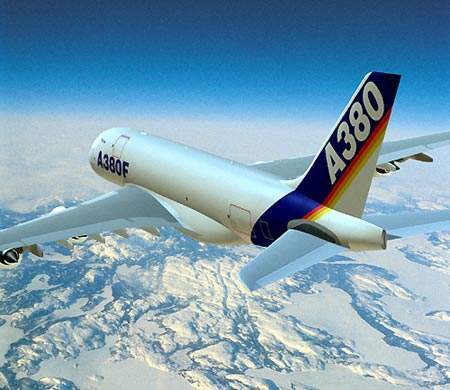 Airbus, already well established in the freighter market with the 54t-capacity A300-600F and the 39t-capacity A310F, has now moved to the upper end of the cargo market with the launch of the A380-800F freighter. Corporate authorisation was announced in December 1999 for the production phases for both the passenger and freighter versions of the aircraft. The A380 passenger aircraft made its maiden flight in April 2004. The A380 passenger version, powered by Rolls-Royce Trent 900 engines, received joint European Aviation Safety Agency (EASA) and Federal Aviation Administration (FAA) Type Certification on 12th December 2006. First metal cut for the freighter aircraft took place in April 2005. Delays to the programme have resulted in Airbus delivering the first A380 to Singapore Airlines in October 2007. Emirates received the first A380 in August 2008 and Air France received it in October 2009. As of October 2011, 78 aircraft were delivered. By November 2011, 243 firm orders were received for A380 from 18 customers. Emirates placed the largest order of 90 A380 aircraft, out of which 14 are already in service and 76 are on order. The first freighters will be delivered in 2012. 25 firm orders had been received for the freighter version: Federal Express (ten plus ten options), ILFC (five) and UPS (ten plus ten options). However, in November 2006, Federal Express announced the cancellation of its order, citing delays in delivery dates as the cause, and LFC has changed its order to the passenger version. The future of the A380F is therefore uncertain. The range of the A380-800F is 10,410km, which allows the aircraft to fly non-stop from Europe to Asia or the US West Coast. The aircraft carries a 150t payload, comprising 71 large cargo pallets or containers on three decks. Airbus claims the payload capacity is 30% larger than that of the nearest competitor aircraft. The aircraft flies at an economical cruise speed of Mach 0.85 and has a service ceiling of 13,100m. The take-off field length is 3,010m. The engines give exceptionally quiet operational noise levels and meet the UK’s Noise Quota Count 2 for departure. A stretched variant, the A380-900F was also planned, with increased payload but reduced range. The Toulouse division of Airbus has designed the layout of the two-crew flight deck. 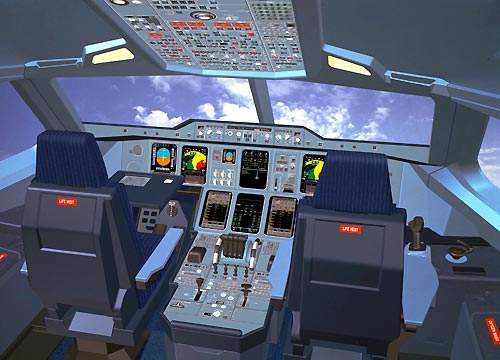 The cockpit is compatible with other in-service aircraft of the Airbus family, allowing airlines to have cross-qualified crew. The aircraft is fitted with a Honeywell flight management system. The cockpit is equipped with eight Thales 15cm x 20cm liquid crystal displays. Thales and Diehl Avionik Systeme have been contracted to supply the integrated modular avionics suite. Rockwell Collins is supplying the 100Mbit/s Ethernet avionics communications with full duplex networking. An onboard information system allows documentation updates and flight planning updates while the aircraft is airborne. An onboard maintenance system can be accessed in real time by ground crew to minimise maintenance time and costs. The A380-800F has a payload capacity of 150,000kg with a range of 10,410km. The upper deck, which has a maximum width of 5.92m, accommodates 17 pallets, while the main deck, maximum width 6.58m, holds 28 pallets and the lower deck 13 pallets. The total hold volume is 1,134m³. The CATIA 3D CAD virtual product design suite from Dassault Systemes and IBM was used in designing the A380-800F. The oval fuselage has a three-deck configuration. Type 2524 light aluminium alloy floor beams are used in the freighter aircraft rather than the composites and type 2024 aluminium beams used on the passenger variant aircraft. Major subsections of the aircraft are under construction at the Airbus Deutschland in Hamburg and Stade, Airbus Espana, Airbus France at St Nazaire, Airbus UK in Broughton, Latecoere in Toulouse, France and Saab in Sweden. 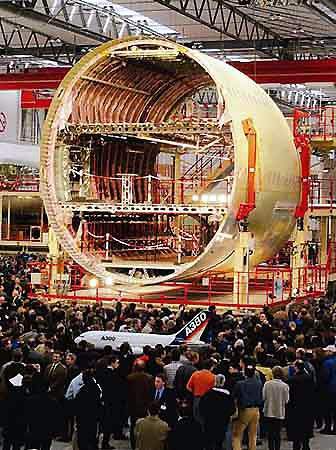 Airbus France at Toulouse is responsible for manufacturing engine pylons and also for the final assembly of the aircraft. High-strength, damage-resistant and lightweight composites and multiple layer aluminium and glass fibre-reinforced adhesives material, Glare, are used extensively in the construction. The swept wings carry four Aircelle underwing engine pods. 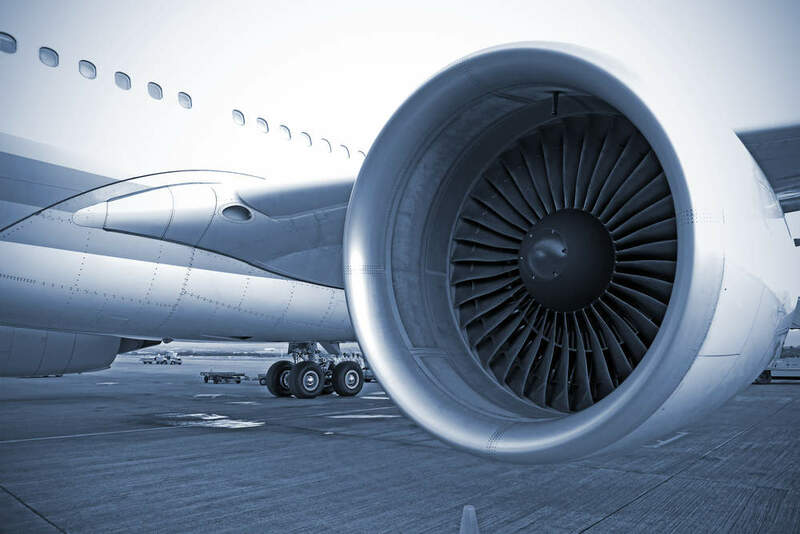 The options for the engines are the GE and P&W Alliance GP7200 and the Rolls Royce Trent 900. The Emirates A380-800F freighters have been ordered with Alliance GP7200 engines while ILFC has selected the Rolls-Royce Trent 900 engines. The Trent 900 engines are rated at 374kN thrust. Each engine is fitted with a Hamilton Sundstrand 180kVA power generator. Aircelle thrust reversers are fitted on the inner pair of engines. The main fuel tanks have a capacity of 325,000l. For extended range operation, optional wing centre box fuel tanks can be fitted. The fuel system is equipped with a Parker Aerospace fuel management system which includes internal tank sensors. The fuel management system interfaces to the Thales integrated modular avionics suite. Goodrich has been contracted to supply the two six-wheel under-fuselage landing gear and the two four-wheeled wing-mounted landing gear. The wing-mounted landing gear is slightly forward of the fuselage-mounted gear. The wheels on the main landing gear are fitted with carbon brakes. The twin wheel nose landing gear is supplied by Messier-Dowty. The steering control is via the nose gear and via the rear axle of the fuselage landing gear. The gear allows u-turn manoeuvres on a 60m-wide runway. The aircraft can manoeuvre on 23m-wide taxiways and 45m-wide runways. The French aerospace company Latecoere, based in Toulouse, developed the external and taxi aid camera system (ETACS). The ETACS consists of five video cameras and an onboard computer. The cameras are installed on the top of the tailfin and under the fuselage and the image data is relayed to cockpit displays to assist the crew in ground manoeuvres. The Honeywell terrain guidance and on-ground navigation system are integrated to the aircraft’s flight management system.